When the painter Hans Meyer-Kassel arrived in Nevada in 1937, his native Germany was on the edge of chaos and genocide. In the serene, expansive Carson Valley, where he and his wife, Maria, would live in Nevada’s first settlement, Genoa, he would learn of the destruction of his birthplace and adopted namesake, Kassel, as well as Munich, where he had studied art. For a time, his work reflected the devastation of war and the turmoil of the global economy, with figures and faces drenched in anguish and hopelessness. Later, his renderings were of hollyhocks, gladioluses, lilacs and the Eastern Sierra’s quiet valleys and majestic peaks. I learned for the first time of Meyer-Kassel’s life and work in May while exploring the Eastern Sierra that had so inspired him. A temporary exhibit at the Nevada Museum of Art in Reno included dozens of his pensive landscape paintings. Before driving south along Highway 395, I wandered slowly around the collection, taken in by Meyer-Kassel’s dreamy impressions and his clear fondness for western Nevada’s lonely terrain. He never seemed to tire of it. I write of this now rather wistfully because I lived in Germany for nearly 15 years and moved back to my native Sacramento in 2014. Those years abroad were filled with adventure and gratitude for the good life in Europe, but they also heightened my affection for sunny Northern California. Furthermore, my German friends would talk with me about their own fascination with the rural American West. That quiet morning at the museum, it struck me that the way Meyer-Kassel perceived the Eastern Sierra landscape mirrored my own reckoning with a desert geography that, growing up in Sacramento, I’d largely dismissed as banal but, years later, kept drawing me back. I had planned to drive from Reno to Devils Postpile National Monument near Mammoth Lakes over the Memorial Day weekend, a journey I’d undertaken twice in the past decade, with both trips reawakening in me enthusiasm for the region. 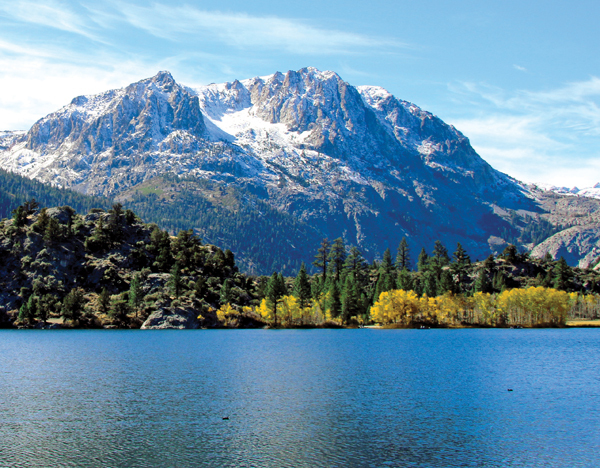 Highway 395, which begins its geographical descent in Washington and ends up in Los Angeles, offers a feast for the eyes as it skirts the Sierra to the west and Topaz and Mono lakes to the east. My tour started on a drizzly day in the Washoe Valley, where I ended up relying on four legs instead of four tires after arriving at Heavenly Hoofprints Trail Rides. There, I met Diana Jones and her seven equestrian tenants. After introducing me to all of them, she let me choose who would whisk me up amid the sagebrush-covered dusty hills to the east of her home. I settled on Samson, a black 13-year-old Percheron, part quarter horse, while Diana chose Bear, a 15-year-old quarter horse paint. We saddled up and headed out. Winter rains had filled the valley floor the previous months, and as we climbed, Diana told me about kayaking some weeks prior. She pointed to a misty Mount Rose in the distance and described a treacherous ride she once made to the ridge a few years ago. A Pennsylvania native, Diana had come to Nevada—her son lives in Reno—in November 2007 after a divorce. It took her a while to find her footing, but she opened Heavenly Hoofprints in 2014 and has led rides for guests from all around the country and abroad. For three hours, we passed gingerly among bitter bush, which the horses relish (but shouldn’t have), as well as desert peach and Mormon tea, all the while scanning the overcast horizon. That chilly vista dissipated by early evening when I entered J.T. 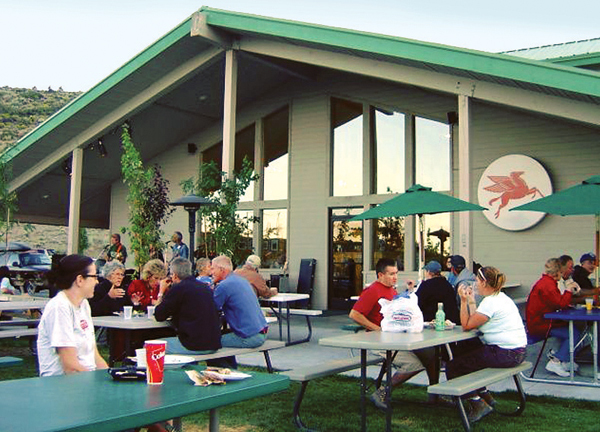 Basque Bar & Dining Room in Gardnerville. It was my second visit, and I was eager for the hearty family cooking. I was also pleased to see Marie Louise Lekumberry again. Her father, Jean, had emigrated from his home on the French side of the Basque Pyrenees in 1947, landing in Gardnerville at age 22 with just $32 in his pocket. Soon enough, he was earning a living, not to mention a favorable reputation, as so many of his countrymen would in those years, by skillful sheepherding in the rural American West. Their cultural legacy is apparent today—in the past four years I’ve been back in California, I’ve managed to dine at Basque locales in Alturas, Bakersfield and several others in between. J.T. has been around since 1960, when Jean, his brother, Pete, and his wife, Shirley, opened the doors of their sheepherder hotel, bar and dining room, aiming to provide the familiar Basque language and culture to their fellow homesick ranch hands. Seemingly little has changed since then. Marie Louise seated me next to her 20-something nephew, Etienne, and two of his friends, who served me beef stew, cooked beans, tossed salad, chicken and french fries—warm, welcome comfort food after a day on the windy range. An abandoned building near Highway 395 in Lee Vining. Photo by Gabriel Teague. I thought later, as I drove into Genoa for the night, how Meyer-Kassel, like the Basque sheepherders, had adopted the Eastern Sierra as home. Just as Germany was capitulating to the Allies in 1945, the Meyer-Kassels had settled into “The Old Gray House,” as Genoa residents called it, on Main Street, sealing their purchase for $500 and a painting. My own hitching post in Genoa that evening was the dainty, nobly named White House Inn, where I was greeted by Lacy, the owner and caretaker. 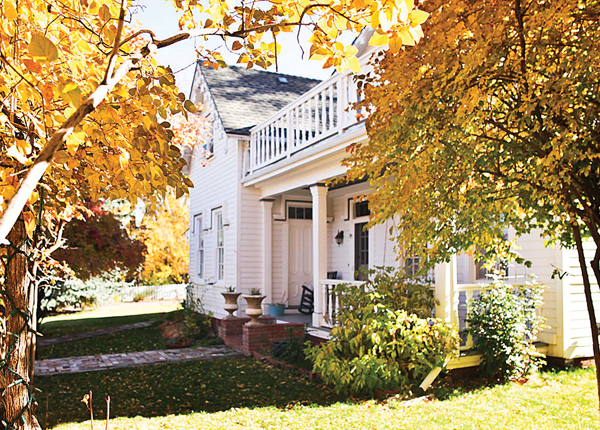 It was late when I arrived, but soft outdoor lighting on the inn’s pearly exterior revealed an elegant and trim restored bungalow, replete with porch and porch swing—a far cry, I thought, from what travelers along the Mormon Emigrant trail happened upon in Genoa in the late 1800s after a treacherous desert journey. With just three rooms to let and a cottage behind the inn, Lacy first showed me the cozy eastward-facing enclosed patio where I would luxuriate in the early morning to sip my tea and watch the sunrise. She then led me upstairs to the King Room, directly under the roof, where slanted walls and windows, along with a spacious bathroom and tub, gave off a warm intimacy, an ideal end to the day’s long drive and ride. I pushed southward again the next day, with ravishing views of the Sierra peaks, one after the other radiating onward into the horizon, and to the east, the desolate and foreboding Sweetwater Mountains. Stalwart cottonwoods, some isolated and leafless from lightning strikes, bordered the road, along with solitary farmhouses and lush meadows. South of Bridgeport, I skipped a visit to Bodie State Historic Park, a well-preserved gold-mining ghost town I’d been to once before, and instead pushed on to Mono Lake. On a previous tour, I’d spent a morning kayaking and floating in Mono’s dense, salty waters. But after the day’s long drive, I was hungry as I drove onward to the Tioga Pass, where I remembered eating exceptionally well at, of all places, a Mobil gas station. Your odds of having a superb meal at the Whoa Nellie Deli, at the Mobil gas station in Lee Vining, are as great as the likelihood you’ll be gobsmacked the first time you see El Capitan. I ordered the deli’s signature tangy fish tacos and squeezed in among other travelers at an outdoor picnic table overlooking the lake. The crowds, most likely headed to the national park, spilled out into the parking lot; I couldn’t recall seeing so many people on my last visits, but clearly since the deli was established in 1996, word of mouth has helped put it on the map. My own map still pointed me southward several miles before I would depart Highway 395 onto Highway 158. There, veering west, I had an indulgent view of the sun descending across the Sierra crest. Then I rounded a bend on what’s called the June Lake Loop, where I soon looked out agape at the very pretty June Lake. Four glacial lakes here have drawn fishing folk and hunters since the late 19th century, as well as hikers keen to scale the surrounding pinnacles. Several years ago, however, it was family ties that led Amanda and Dave Carmichael to look for a lodging project at June Lake, where her parents had dated, married and have now retired. They bought the June Lake Pines Cottages, which were built in the 1920s and served as cabins for U.S. Forest Service laborers, and then spent two years renovating but also retaining the structures’ vintage character. I had reserved one of the snug bungalows facing craggy peaks, and after unpacking, I headed for Gull Lake up the road, where a flat trail led me through birch groves and across meadows, and I watched fishermen glide across the still waters. I wasn’t, however, so pleased in the morning when I learned that the road to Devils Postpile National Monument was still closed for repairs. I drove on to the Double Eagle Resort for breakfast while pondering the day’s options. Over a light and flavorful vegetarian omelet, I studied a hiking map and saw that the trailhead to Fern Lake was just around the corner. Within the hour, I was on the strenuous, ascendant path that passes waterfalls and afforded me a stunning perspective of Mono, Silver and Grant lakes. Fern Lake lies at the base of snaggletooth granite cones, encircled by pines, providing a scene that might well have inspired Hans Meyer-Kassel almost a century ago. Perched on a log at the water’s edge with my back against a tree, I unpacked my trail mix, took off my socks and, while soaking my feet, reflected on Meyer-Kassel’s journey from Europe to the New World, how he had been so inspired by a seemingly barren vista but one that, like for me, continued to beguile and allure.